The signing ceremony of documents for four grant assistance projects under Bhutan Trust Fund for Environmental Conservation’s MB-grant scheme, namely Samarzingkha Agro-forestry Project; Building Socio-Ecological Resilience: An Adaptation to Progressive Climate Change in Sakteng Wildlife Sanctuary; Introducing Environmental Science in Formal Education in Bhutan in Classes XI and XII; and Zero Waste Project in Samdrupjongkhar and Wamrong was held on 21 July 2017, at GNH Commission. In this ceremony, the grant agreement for the above mentioned projects were signed between BTFEC, GNH Commission and the grant recipients. The total amount for the four projects is over Nu 28.95million. Except for the ‘Zero Waste Project in Samdrupjongkhar and Wamrong,’ the other three projects are from Grant cycle December 2016. The goal of this project is to protect and convert whole Samazingkha ridge into a beautiful Agro-forestry landscape. The site is located at the heart of Thimphu valley covering 330 acres (including the extended area), and falls in the southern aspect. In the recent years this area has been repeatedly burnt down by the forest fire. Now with the entire Agro-forestry component put in place, Ministry of Agriculture and Forests is putting collaborative effort to convert the ridge into beautiful Agro-forestry landscape. Under this project, the ridge with steep slope will be converted into two-foot width terrace along the contour lines, with five-meter spacing. In these terraces, saplings of forestry trees, horticultural fruit trees, and ornamental trees will be planted with spacing of four-metres. the space between the saplings will be used for agriculture crops. The area with gentle slope will be converted into paddy and horticulture crop fields. Since the project site has shortage of water, it aims to irrigate the site with water from Thadra Geonpa area. As interim measure, rain water harvesting method will be put in place. Numerous check dam will be constructed at strategic locations to trap the rain water and used for irrigation. Where possible, the terraces will be irrigated using drip irrigation. Water from check dams will be used for irrigating the paddy fields. Numerous infrastructures like project office, Royal Rest House, roads, fencing, drains, gate, ESP quarters, and transmission lines will be developed. 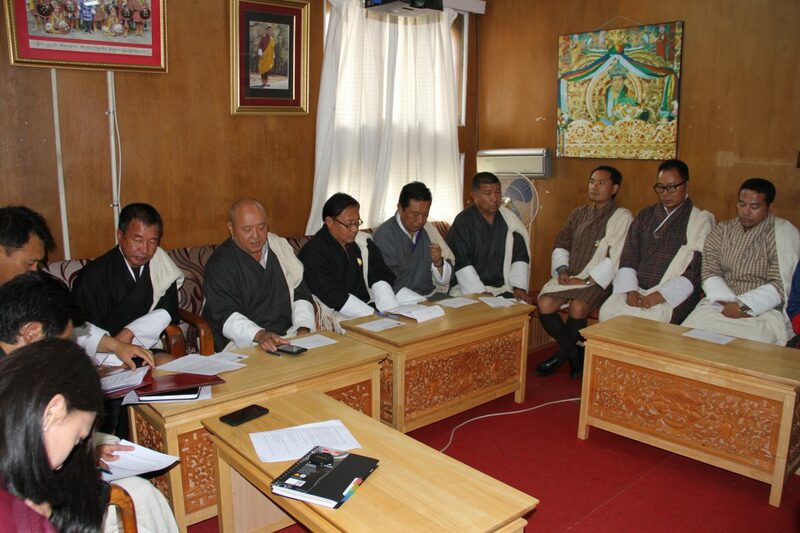 Thimphu Forest Division is the overall coordinator of the project, under the Division a project office will be instituted to coordinate and consult concern stakeholders for related works. Climate change is emerging as the biggest threat to human and wildlife communities. The temperature of the earth is rising because of the release of greenhouse gasses, mainly by developed countries. Although Himalayan communities have contributed very little to the rise of the earth’s temperature, we will be among the first to suffer from the consequences. As the effects are at a global scale we must seek ways to mitigate the threats and adapt our living styles to minimize the threats to human communities and natural ecosystems. The Inter-Governmental Panel on Climate Change (IPCC 2007) has predicted that the average annual temperature in the Himalayan region will increase by 3° C in 2050, and 5° C by 2100, and the annual mean temperature has demonstrated a consistent warming trend at approximately three times the global average. Precipitation is also expected to increase, although in an erratic and unpredictable manner. Assessment of Sakteng Wildlife Sanctuary (SWS), using Bhutan management effectiveness tracking tool Plus (METT+) 2016, indicated climate change and severe weather as one of the potential threats for the park in near future. The Bhutan METT+ 2016 is a holistic approach meticulously articulated to measure protected areas effectiveness to manage its biotic and abiotic resources. This project intends to tackle the threats from long term climatic changes on the biodiversity, human livelihoods, and water resources in and around SWS through three major activity components: Climate Change Adaptation, Land Use Assessment and Natural Resource Management. This project will strengthen the current effort of introduction of environmental science in class IX and X by further addressing the gaps in higher secondary schools and thereby contributing to a consistent, comprehensive and meaningful learning at the university level. The continued course in class XI and XII was envisioned along with the introduction of Environmental Science in classes IX and X, mainly to make Environmental Science meaningful for students in terms of continuity and encourage students to pursue specialisation in environmental studies. The project based learning approach to environmental science will provide ample opportunities for learners to gain deeper understanding about the environment and the relationship of biotic with the abiotic for the wellbeing and sustainability of the natural world. Thus, the activity packed learning experiences in this subject will ensure that every student takes responsibility in their learning, and instil positive attitude and values towards the environment. This initiative will also contribute to curriculum diversification. With ES regularised in schools, it is expected that more youths will be encouraged to pursue environment related studies in their higher education. Consequently, in the long run, it will help to address the dearth of much needed environmental experts within the environment sector in the country. The Samdrupjongkhar Initiative’s (SJI) Zero Waste Programme under Lho Mon Society began in 2012 with two pilot sites in Wooling village (rural pilot) and Dewathang town (semi-urban pilot). The programme has since been scaled up and expanded to Orong village and Samdrupjongkhar town, with small community-driven side projects in Pemathang, Rishore and Narphung villages. The primary objective behind the project is to foster systems and mindset that activates sustainable waste reduction that are both sustainable and locally appropriate. Under this project, in collaboration with Jomotsangkha and Samdrupcholing Dungkhags in Samdrupjongkhar and Wamrong Dungkhag in Trashigang, SJI will upscale its successful project to Phuntshothang under Samdrupcholing, Langchenphu under Jomotsangkha and Wamrong satellite town under Wamrong Dungkhag. Wamrong has been chosen for its proximity to Narphung, SJI’s zero waste collaborators. The SJI’s very close collaboration with theses dungkhags is aimed at making waste management and the zero waste practices a model. The idea is to create model villages and towns for replication and scaling up of zero waste activities in other urban and rural places, which in turn will have wider impact in turning Samdrupjongkhar and Trashigang Dzongkhags into a zero waste dzongkhags eventually. SJI will continue to pursue its ultimate goal of reaching out and replicating its success stories beyond Samdrupjongkhar. After signing the grant agreements, in order to familiarize the project coordinators and accountants about the project implementation and reporting systems an orientation programme was conducted by BTFEC at its office.